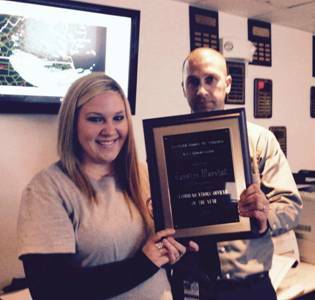 Caroline Marshall was selected and recognized as the Communications Officer of the Year for 2014 by the Eastern Shore of Virginia 9-1-1 Commission. Caroline started her employment with the 9-1-1 Commission in early 2012. She was nominated by her colleagues for this recognition award and selected by a committee of public safety professionals representing both counties. Congratulations, Caroline! Thanks for your contributions to public safety and for your dedication and commitment to public safety communications. Thanks to all Communications Officers for your outstanding work and commitment supporting public safety! Jeffrey A. Flournoy, Director of the Eastern Shore of Virginia 9-1-1 Center, has been certified as an Emergency Number Professional (ENP) by the National Emergency Number Association (NENA). Certification is a tool of the professional association to establish the benchmarks of performance that signify a broad-based competence in the professional field. Those successfully completing certification demonstrate a mastery of the comprehensive knowledge base required for emergency number program management, help to raise industry standards and increase the respect and prestige of those involved in 9-1-1, and confirm their commitment to the 9-1-1 profession by showing themselves as leaders in public safety and maintaining awareness of current issues and developments in the field. 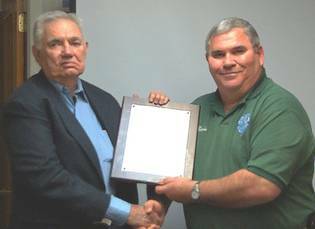 Photo: 9-1-1 Commission Chairman Donald Kellam (L) recognizes and congratulates Flournoy (R) at the March 2015 Commission meeting. A commercial supply ship bound for the International Space Station exploded moments after liftoff at Wallops Island on October 28. NASA held a news conference to discuss the mishap that occurred at Pad 0A of the Mid-Atlantic Regional Spaceport at NASA’s Wallops Flight Facility in Virginia during the attempted launch of Orbital Sciences Corp’s Antares rocket and Cygnus cargo spacecraft at 6:22 p.m. Tuesday, October 28. Damage related to the launch attempt of an Antares rocket was contained to the hazard area, but there may have been a scattering of debris. If people find debris in the vicinity of the launch, stay away and call the Incident Response Team at 757-824-1295. The Eastern Shore of Virginia 9-1-1 Commission is currently reviewing submitted proposals for a qualified two-way radio communications company or service shop to provide, deliver, install, and integrate new simulcast dispatch radio system (for primary Fire-EMS communications) and related tasks. Sealed proposals were received on June 23, 2014. The Eastern Shore of Virginia 9-1-1 Commission awarded L. R. Kimball, a communications engineering and consulting firm, a contract to study, plan, design, and engineer various RF communications interoperability solutions to improve and enhance interoperable communications for the public safety agencies and personnel in and/or operating in Accomack and Northampton Counties, Virginia. Special attention was directed to interoperability with neighboring Hampton Roads (VA) and Maryland counties. In addition, the consulting firm, as it relates to interoperability with neighboring jurisdictions, audited the current system, analyzed the functionality and operations of the system, and developed a comprehensive plan to provide detailed interoperability implementation plans for the future. A report was submitted to the Commission in February 2014 and is available for review upon request. The planning study was funded by a Homeland Security grant managed by the Virginia Department of Emergency Management. We are saddened by the loss of Jim Seymour. Jim was recognized for his outstanding service in 2012… a copy of the resolution is reprinted below. 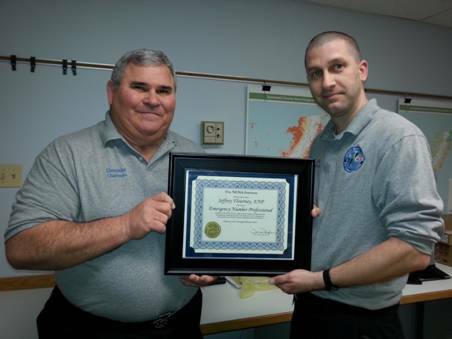 NOW, THEREFORE, BE IT RESOLVED, that the Eastern Shore of Virginia 9-1-1 Commission expresses its appreciation to Jim Seymour for his dedicated service as a Motorola radio technician and for his exemplary contributions in support of public safety communications. FURTHERMORE, BE IT RESOLVED, that a copy of this resolution be recorded in the Commission’s minutes, that a copy be presented to Jim Seymour, and that this resolution be shared with his professional colleagues and with the public safety community to which Jim so ably provided his knowledge, skills, and abilities. Resolved this 26th day of January, 2012. 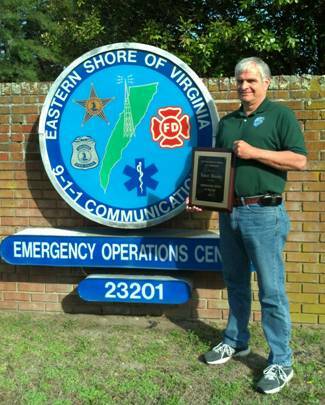 Robert Wessells was recently selected and named the Communications Officer of the Year for 2013 by the Eastern Shore of Virginia 9-1-1 Commission. Wessells started his part-time employment with the 9-1-1 Commission in early 2012. He was nominated by his colleagues for this recognition award and selected by a committee of public safety professionals representing both counties. Congratulations, Robert! Thanks for your contributions to public safety and for your dedication and commitment to public safety communications. 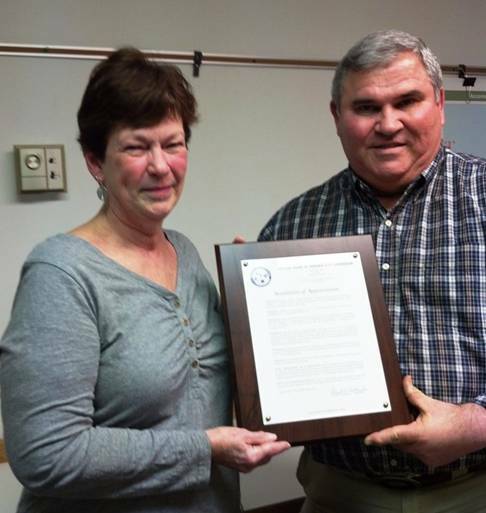 Marge Surran receives a Resolution of Appreciation from 9-1-1 Commission Chairman Donald Kellam at the Commission’s meeting on January 30, 2014. Supervis0or Surran retired on December 1, 2013, after 20 years of dedicated service. Surran also received a Certificate of Recognition and Appreciation from the Virginia Chapter of the Association of Public-Safety Communications Officials – International. NOW, THEREFORE, BE IT RESOLVED, that the Eastern Shore of Virginia 9-1-1 Commission does hereby adopt this Resolution of Appreciation and thanks Supervisor Marge Surran for her valuable contributions to the Eastern Shore of Virginia’s citizens and visitors and her management and progression of the 9-1-1 and emergency dispatch system. BE IT FURTHER RESOLVED that a copy of this Resolution be presented to Supervisor Surran and spread upon the minutes of the Eastern Shore of Virginia 9-1-1 Commission. Adopted this 5th day of December, 2013. The Eastern Shore of Virginia 9-1-1 Commission completed system-wide narrowbanding, distribution of new mobile and portable radios, and a program channel refreshing of legacy radios for Eastern Shore public safety agencies and field users in December 2012. A Communications Infrastructure Workgroup (CIW) set standards and assisted in coordinating plans. RCC Consultants, Inc., provided consulting services to the Commission and CIW. Radios were selected for purchase during the summer. Agency orders of field radios were received and procurement was completed through Delmarva Two-Way Radio, Inc., in late summer and early fall. Infrastructure replacement radios were ordered from Atlantic Communications; installation and system upgrades were completed by Atlantic during late fall and early winter. Funding for the Northampton-Accomack Public Safety Communications Project (NAPSCOM) was provided through a Homeland Security grant administered by the Virginia Department of Emergency Management. Participating agencies included ESVA 9-1-1, all Accomack and Northampton County fire and EMS agencies, Accomack and Northampton County Sheriff’s Offices, Accomack and Northampton County Public Schools, and town police departments. The project programmed, installed, and placed in service 265 new mobile radios, including 154 VHF mobiles for fire and EMS agencies, 53 UHF mobiles for law enforcement agencies, and 18 VHF mobiles for public schools. Forty VHF mobiles, previously purchased by Accomack County Public Schools for their bus fleet, were also installed. Additionally, the project programmed, distributed, and placed in service 383 new portable radios including 260 VHF portables for fire and EMS agencies and 123 UHF portables for law enforcement agencies. ESVA911 staff and communications vendors also reprogrammed, narrowbanded, and updated channel plans for 219 legacy radios which were not replaced by new radios. This included 46 mobile and 173 portable radios for fire and EMS, law enforcement, schools, and health. Staff also narrowbanded 523 Minitor V alerting pagers for fire and EMS. Additional system upgrades are planned for 2013. The Tidewater Emergency Medical Services (EMS) Council recently honored 10 providers and agencies for their dedication to the community and their commitment to the EMS system. Regional award winners were nominated by their peers and awarded for their accomplishments during an presentation held on June 16, 2012 at the Virginia Zoological Park, Norfolk, Va. Eastern Shore 9-1-1 was well represented among the recipients. Congratulations to Crystal and Jeff! Award Presentation Comments: “The Outstanding Public Safety Telecommunications Officer exemplifies the best in EMS dispatching. This person supports and utilizes emergency medical dispatch techniques, clearly communicates with responders, and works above and beyond the call of duty to ensure the patient receives the quickest and best care possible. This award category this year received more nominations than all others. This is a significant recognition of the importance of those “behind the scenes” who work so hard and whose voice is our lifeline and guidance. “This year’s recipient has consistently displayed maturity and professionalism in their role as a Communication Specialist. This recipient has been an emergency telecommunicator since 2003 and a supervisor since 2008. Her supervisor says this recipient “is always willing to assist responding personnel in any way and assist stations with any data and information they may require.” This emergency telecommunicator goes above and beyond the call of duty to cover shifts and is always willing to listen and lend assistance to other dispatchers with both personal and work related problems. As an instructor in APCO Basic Telecommunicator and Emergency Medical Dispatch (EMD) programs, this recipient plays an active part in the quality improvement of the EMD programs which ensures that this communications center maintains Virginia Office of EMS EMD Accreditation. This year’s recipient is also an active EMT with the Parksley Volunteer Fire Company. Award Presentation Comments: The Bruce W. Edwards Outstanding EMS Administrator Award recognizes outstanding leadership and management qualities for EMS personnel at all levels that have supervisory or administrative duties. This year’s recipient is responsible for the recruitment and management of the Communication’s Center staff, preparation and maintenance of the operating budget, and oversight of the daily operations in the 9-1-1 Communications Center. This Communication Center provides primary fire and emergency medical dispatch for over 52,000 residents throughout two counties. This recipient was appointed as the Director in 2007 and through hard work and dedication to the 9-1-1 Center and local fire and EMS services, huge advancements have been made across the Eastern Shore. Under his leadership, the 9-1-1 Center has been fully accredited by the Virginia Office of EMS as a Public Safety Access Point providing emergency medical dispatch (EMD) to its callers. Recently a $1.3 million grant has been awarded to replace and update both field radios and radio communications infrastructure equipment for public safety and the school system on the Eastern Shore to strengthen the overall communications system. This year’s recipient is also a member of the Community Volunteer Fire Company in Exmore, Virginia, serving as an EMT and the Assistant Fire Chief. His management style and thorough follow-up on all issues demonstrates the highest level of stewardship for the organization and community. The efforts of this year’s recipient continue to build and improve the 9-1-1 system as well as the fire and EMS services every day. Congratulations to this year's Outstanding EMS Administrator, Jeffrey Flournoy – Eastern Shore 911 Communications Commission. Two vendors responded to the Eastern Shore of Virginia 9-1-1 Commission’s Request for Proposals seeking a qualified two-way radio communications company or service shop to provide, deliver, install, and integrate new base station transceivers, receivers, comparators, and control stations; narrowband existing fixed radio equipment; and expand channel capacity and reprogram (as necessary) the existing Motorola consoles at the Eastern Shore of Virginia 9-1-1 Center. Proposals were received from Atlantic Communications, Inc., and Gately Communications Company. To review the project’s statement of work, download “ESVA 911 Statement of Work – RFP #911-12-001”. The 9-1-1 Commission has authorized award of the contract to Atlantic Communications of Newport News. The project is now underway; the timetable for equipment procurement and installation will provide for infrastructure improvements prior to the end of the year. The Eastern Shore of Virginia 9-1-1 Commission has adopted recommendations from the Northampton-Accomack Public-Safety Communications (NAPSCOM) Project’s Radio Evaluation Committee for radios to be purchased through the project grant. The mobile radio selected is Motorola’s ASTRO® XTL™ 2500. The radio will be available in dash mount, remote mount, and dual control head mounting options. Agencies will be able to select from two portable radios: Kenwood TK-5220/TK-5320 VHF/UHF FM P25 Digital Portable Radio or the Motorola XTS®1500 Digital Portable Radio (Model 1.5). Radios will operate on conventional analog channels. Agencies have submitted orders for radios to be funded by the grant and orders are currently being validated and placed through Delmarva Two-Way Radio, Inc., of Ocean City. The grant covers replacement of radios which are not narrowband compliant or which lack available channel and feature capacity for public safety operations. The Eastern Shore of Virginia 9-1-1 Commission, on behalf of the Eastern Shore’s public safety community, recognized and honored Motorola Radio Technician Jim Seymour of Painter for his years of outstanding service and support of public safety communications at the Commission’s monthly meeting on Thursday, January 26, in Accomac. 9-1-1 Center Director Jeff Flournoy, 9-1-1 Consultant Scott Chandler, and Delmarva Two-Way Radio President Milt Warren spoke of Jim’s continued dedication and support to public safety and his special contributions to support the local public safety radio systems. In addition to the Commission and staff, Jim’s wife, Patti, and Milt’s wife, Gerri, also attended. Commission Chairman Donald E. Kellam, Jr., presented a plaque with the following resolution to Seymour following its reading by Flournoy. During December 2011 and early January 2012, information regarding the NAPSCOM Project (Northampton-Accomack Public-Safety Communications) was provided to Fire, EMS, Law Enforcement, and Public School entities/agencies. The purpose of this information was to verify radio inventories and provide an update on the project. As a reminder, the NAPSCOM Project is intended to improve public safety radio communications (focusing on operability and interoperability) as well as assist agencies in meeting the federally mandated narrowband requirements (effective in 2013) using available federal grant funds with additional investment of funds from other sources. Communications Infrastructure Workgroup (CIW) Members, Fire/EMS Agency Leadership, Law Enforcement Agency Leadership, and Public School System Leadership attended a formal presentation by RCC Consultant’s on January 17, 2012 at the Eastern Shore Community College (Melfa). RCC Consultants Jeff Pegram and Wayne Campagna have been working closely with Virginia Eastern Shore public safety entities and the 9-1-1 Commission throughout much of 2011 on this project and anticipated use of grant funds. The presentation provided an overview of future radio system/infrastructure improvements, how we expect to use available grant funds (to improve radio communications and prepare for the narrowband mandate), as well as overall timelines. This provided an opportunity for public safety leadership to hear and discuss where we are heading with regard to improvements to public safety communications and the use of available grant funds. The Eastern Shore of Virginia 9-1-1 Commission has entered into a contract with RCC Consultants, Inc., a public safety communications system design and engineering consulting firm with offices in Glen Allen, Virginia, to provide analysis, review of current radio system and its elements, make recommendations and provide direction for public safety radio systems in both counties. RCC will be working with ESVA 9-1-1 staff and representatives of the Communications Infrastructure Workgroup. RCC was selected from among eight proposals received. RCC provided a report to the Commission earlier this year. The Commonwealth of Virginia, Virginia Information Technologies Agency, by request of the Eastern Shore of Virginia 911 Commission, has analyzed communications equipment and performed radio studies throughout the Eastern Shore of Virginia (ESVA) 911 service area. A summary of the report is provided in an Executive Summary. To read the Executive Summary, click here. Key agencies have been provided electronic copies of the extensive report. If additional information is needed related to the report or copies of the report are desired, contact the 9-1-1 Director. The VITA study provided an overall system documentation and basic recommendations for improvements; additional and more detailed analysis will occur to upgrade the current system in response to current needs and the VITA recommendations. The ESVA 9-1-1 Commission has released a revision to Appendix O of the Communications Manual (radio specifications). It includes significant changes to the radio specifications (portables and mobiles) recommended by the 9-1-1 Commission for fire and EMS field users. The specifications incorporate recommendations from the state and specifications to prepare for future channel and interoperability needs and should be used for future procurements/purchases. 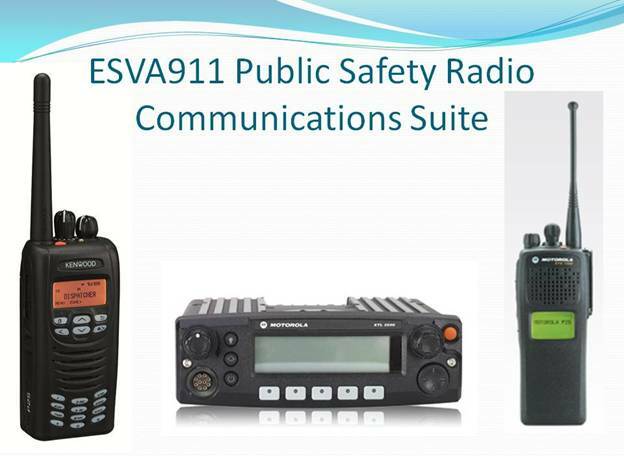 The ESVA 9-1-1 Commission (working with the Communications Infrastructure Workgroup) is recommending these standards to position public safety users with future capabilities for the latest system technologies and interoperability as we move toward system upgrades and enhancements. Radios currently used in our system will continue to function as they currently do, however as future upgrades to the radio system and channel plan are made they may become incompatible with system requirements. These attached specifications will be used for radios purchased with future grant funds. If there are any questions please contact the Director. The revised Communications Manual was approved by the Accomack County Fire-Rescue Commission and Northampton County Fire-Rescue Commission during the fall of 2008. Amendments are made periodically. To review the Communications Manual, select the Communications Manual link in the Table of Contents (left panel) or click here . For a list of changes made by date and section, click here. At the request of the Eastern Shore EMS Council, the ESVA 9-1-1 Center will be auto-launching (requesting to actually launch) the closest air ambulance for entrapment motor vehicle accidents with significant injury. This will be a pilot program and is designed to improve patient care and transport. A map was created to show first-due/second-due districts for Trooper 4, Nightingale, and Life-Evac III and will be used when requesting a medical evacuation response. 1. Confirmed entrapment - The 9-1-1 Center is shifting from a policy where entrapment was interpreted very loosely (people might be entrapped or looks like they are unable to get out) to a stricter policy. We (the 9-1-1 Center) should have reliable information (indicating a patient is entrapped) from a caller on-scene for an auto-launch to be initiated. 2. Information about a patient with one of the criteria met (from an individual on-scene with the patient or patients): 1. Unconsciousness, 2. Ineffective breathing, 3. Penetrating head, neck, torso, shoulder, or groin injury, 4. Complete amputation of hand, arm, foot, or leg . To simplify, for the 9-1-1 Center to initiate an auto-launch there must be confirmed entrapment and information indicating a patient is either unconscious, have ineffective breathing, a penetrating injury (specific area), or an amputation. Field personnel still have the authority to request the launch of a medivac at their discretion at any time. These requests will be honored without question. This change to the auto-launch policy will not change the two station alert (for extrication equipment). MVA incidents with entrapment/possible entrapment will continue to follow the two-station (for extrication equipment) policy. Please make sure individuals under your charge are aware of these changes. In September 2007 the Eastern Shore of Virginia 9-1-1 Center implemented the APCO Emergency Medical Dispatch program. The program provides consistency in the call-taking of EMS incidents, priority of EMS incidents, and pre-arrival instructions. In February of 2008 the 9-1-1 Center was recognized as being an accredited emergency medical dispatch (EMD) center, after submitting the necessary documentation to the Virginia Office of EMS. Key components of meeting the accreditation standards include using an approved EMD program, having at least 25% of Communications Officers certified in EMD, always having at least one Communications Officer on duty certified in EMD, maintaining forty hours on continuing education every two years, and having a quality assurance and improvement process in place. The 9-1-1 Center has taken the steps to certify all Communications Officers in EMD. At the July 31st, 2008 9-1-1 Commission meeting, Ken Crumpler and Wayne Berry, from the Virginia Office of EMS presented the Center’s Director, Jeff Flournoy, with a plaque recognizing the accreditation of the 9-1-1 Center. The Association of Public-Safety Communications Officials International (APCO), the world's largest organization dedicated to public safety communications, is a member driven association of communications professionals that provides leadership; influences public safety communications decisions of government and industry; promotes professional development; and, fosters the development and use of technology for the benefit of the public. The APCO Institute Emergency Medical Dispatch Program is based on the NHTSA National Standard Curriculum for EMD and incorporates all of the current ASTM International guidelines in a comprehensive EMD Package.